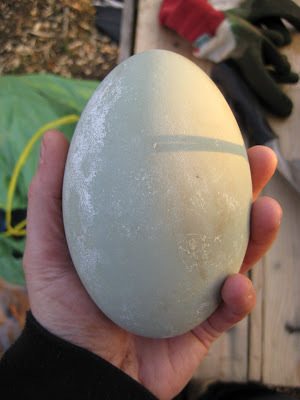 Remember that blue-ish egg we accidentally smashed up whilst digging. The one that was buried in the soil? Well... we found another one! 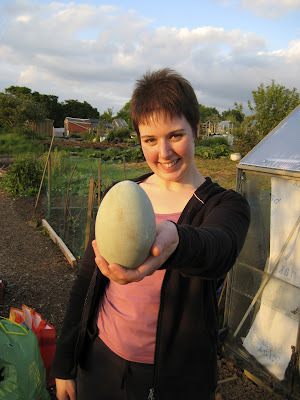 But this time it's a whole egg and it's huge! 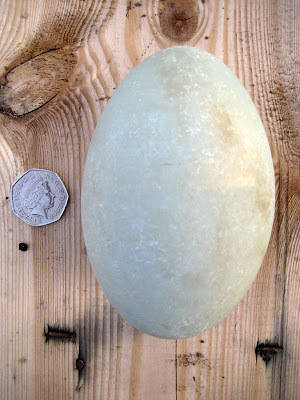 We think it's a swan's egg now as I can't see a duck passing anything quite so big and geese eggs look different. I've seen some pictures of swan eggs online so I reckon it's one of those. The lake near by has lots of swans, ducks and geese so I think Mr Foxy has been pinching them and burying them in our plot. 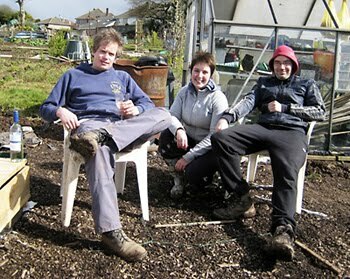 Explains why so much has been dug up over night - including our strawberries! Grr! Pretty tho - but what can we do with it? What can we do with it apart from let Mr Foxy have an extra large omelette? I ain't squatting on it!